According to a report from the Congressional Budget Office, the tax bill could negatively affect Americans in the lowest income brackets. The Senate GOP's tax bill could hurt Americans in the lowest income brackets more than originally expected. According to a report from the Congressional Budget Office, if the proposed legislation goes into effect, individuals who make less than $30,000 would pay more in taxes and receive less in government aid by 2019. By 2021, people earning $40,000 or less would feel the pinch. And by 2027, most Americans making under $75,000 per year would be negatively impacted. On the flip side, the CBO's report predicts Americans who earn more than $100,000 would get significant tax cuts and benefits. Republicans reportedly hope to have the full Senate vote on the tax bill as soon as Thursday. 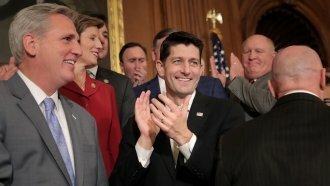 The House already passed its own version of the legislation, dubbed the Tax Cuts and Jobs Act, earlier this month. If the Senate passes its bill, the two chambers will have to reconcile the differences in conference.